All people need folic acid to survive, since it’s essential for healthy cell division in our bodies. 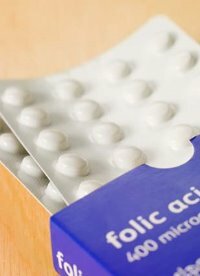 However, scientists have found that folic acid prevents neural tube defects (NTDs) such as spina bifida and anencephaly. There’s also some evidence that certain heart defects and cleft palate can be deterred by taking at least 400 mcg of folic acid per day. In fact, the CDC estimates that folic acid can reduce the risk of spina bifida by 70%! Folic Acid is a B vitamin needed for the body to make new cells. The first few weeks of a baby’s development from zygote to fetus depends on rapid cell division. A lack of folic acid during this time can result in NTDs, or defects of the spine and brain. The CDC recommends that women begin taking higher levels of folic acid before they get pregnant, if possible. The recommended level is 400 mcg per day. Because it’s such an important vitamin, it’s becoming easier and easier to find folic acid both in vitamins and foods. Folic Acid is found in most multi-vitamins or pre-natal vitamins and is added to some breads and cereals. Check the food label for the percentage of folic acid that’s been added. Make sure you get a 100% daily value (DV) either from one source or a combination of sources.